Feng? I was calling you "Fang" this whole time. I am really looking forward to fight Dolgdjohn Jiknhlfnhsomething. I actually wish this weren't a placeholder..
"LFM MSV, We're at Jiknhlfnhsomething, ready to summon!" Leaving only this boss to be blessed with the glorious name he had as placeholder. When the blue crystal object is clicked, an extra button appears on the taker's UI. When used on a raid member, a ~10 sec channel starts. Channeler must stand still and the target raid member must be within range (not sure, feels like 20 yards). If the target receives a debuff during the channel, the channel will stop and you will be able to cast the debuff on an enemy target (boss) with the button. As offtank I generally used it on the main tank. In phase 1 I stole Lightning Lash, in phase 2 Flaming Spear and in phase 3 Arcane shock. This was a huge dps increase (#2-3 on damage done in 10man). The boss is a 3 phase encounter, which trigger randomly at 99%, 66% and 33% with the phases and some abilities which are the same by function but differ in the elemental type. Nullification Barrier negates some effects of Epicenter, Wildfire Spark and Arcane Velocity. Shroud of Reversal works similar to Dark Simulacrum, but an allied unit must be the target and it copies the spell, which hit the target. Each tank can just take one ability. He casts in intervalls greater than 20 seconds Lightning Lash on the tank, so the other tank has to taunt. Lightning Fists is a ball of lightning, which strikes every target in a row, but can easyly be dodged. Epicenter is an area of effect spell, which deals less damage to players standing at a greater distance. Be sure to dodge the Lightning Fists and press cooldowns to reduce the timeframe of this phase. Like the Lightning Phase he casts Flaming Spear which is the trigger for tankswitch. Wildfire Spark is a 5 second debuff, which leaves an area of flame. Be sure to plant it in a way your group NOT in a direct path between the flamepatch and the boss, when he pulls it to himself. Draw Flame pulls all flamepatches towards him and allows him to deal fire damage to everyone in this room with melee attacks. He gets one charge per absorbed flamepatch. Beware, the flamepatches are cluster of small flames. Prepare to have some heal for the flames which cannot be absorbed and do a damage stop, to prevent him carring any charges in the next phase. Like the Lightning Phase he casts Arcane Shock which is the trigger for tankswitch. Arcane Resonance is a debuff on a random player, which deals damage every few seconds and the damage is increased by the number of targets hit. The range of the spell is indicated by a small violett circle around the player. 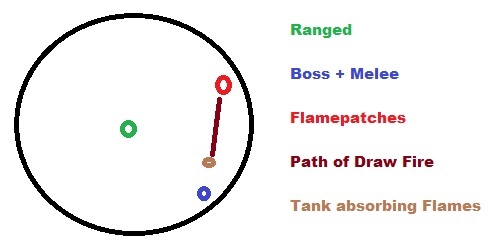 In this phase the boss should be tanked in the middle, while the raid positions in a circle around the boss. This prevents Arcane Resonance dealing too much damage, if a player does not react as fast as he should do. When the boss starts to cast Arcane Velocity the raid should stack at the boss (excluding the one with the debuff) and spread out as soon as the spell is finished. Again Nullification Barrier can be used every second cast and prevents a lot of damage. The boss has an additional phase and the phases start at 100%, 75%, 50% and 25%. It is now possible to choose the order of those phases by tanking Feng close to the statue holding the corresponding weapon. With each phase, Feng gets a buff called Strength of Spirit increasing his damage by an additional 5%. As a result of this you want to do the high damage phases at the beginning, because staff would most likely just kill you with the buff stacked too high. He casts in intervalls greater than 20 seconds Shadowburn on the tank, which is a stacking debuff with the same mechanic all phases above have. Feng will toss his Siphoning Shield at a random side of the room, creating a voidzone and leaving the shield at this position. In addition the shield tears the soul of every player out, causing Soul Fragment to slowly move towards the shield. Those adds have to be killed as soon as possible, because when they reach the shield they get absorbed. After all Soul Fragment are gone (killed or absorbed), Feng equips his shield again and is healed for 10% of his HP per soul absorbed. In addition those fragments will get drawn into the shield, if they are alive for too long. Chains of Shadow is an unavoidable shadow chain lightning, with infinite jump range, dealing moderate damage. To handle this phase the raid should stack in the center of the room, which improves the time you have to react to Siphoning Shield and run away to the other side of the room, in order to create maximum range to the shield and have the fragments stacked up for better bomb damage. Those Soul Fragment have the absolute priority and every possible slow/stun should be used to prevent them from moving. A Death Knight can realy shine here with and Gorefiend's Grasp. Every second shield should be annulated with Nullification Barrier by either letting despawn all Soul Fragment or despawning the shield and shortly after the fragments are gone too. This healps a lot to shorten this phase since the DDs have more time to do damage at the boss. I havent seen this mentioned yet but in phase one if you are not worried about dps the offtank with the Shroud of Reversal can steal lightning fists and then use it on the boss to interupt epicenter. this way our group Barrierd one interputed the next Barrierd the one after etc, this takes good timing by the offtank but cuts down the healing requirement of phase one allowing healers to save mana and CD's for the later phases. The dark blue crystal is the Shroud of Reversal, and the light blue crystal is the Nullification Barrier. The Shroud has a 30 second CD, and the Barrier has a 60 second CD. Warrior tanks are fantastic for barrier in the first phase of this fight. They can heroic leap to the raid, leaving only the slow melee and the off-tank unguarded in the first ticks of Epicenter. The achievement in this boss is called Anything You Can Do, I Can Do Better... One drawback to this achievement is that if you are using the strat that calls for interruption with fists of lightning, you will have to sacrifice one stun in order to capture and use epicenter (whenever you copy epicenter, he will cast it again before the CD allows you to get a fists of lightning copy.) Every other ability is easy to copy, provided you pay attention to raid frames or DBM callouts. The tank who will steal the buff must use a macro to guarantee the steal. Use this macro as soon as you see boss casting Lightning Fist. Then you will have no problems with stealing it. We failed too much acquiring the stun buff. After this macro, we never missed a single stun. Be aware that the tank abilities Nullification Barrier & Shroud of Reversal are channeled. Do not move after clicking the button or the spell will be canceled. In heroic difficulty, the tank should drag Feng to the correct statue at 100%, 75%, 50%, and 25% so that he will activate the weapons in the order desired. The mechanics are virtually the same aside from the high damage and the addition of a new phase: Spirit of the Shield. Tank swap at 2-3 stacks of Shadowburn. Every 30 sec, Feng will toss his Siphoning Shield onto the side of the room. The shield will then tear out a soul from every player, which then slowly walks towards the shield. If any soul reaches the shield, it will be absorbed. In addition, there is a timer: after a certain amount of time, all the souls will be instantly absorbed by the shield regardless of proximity to the shield, so you cannot hold the souls indefinitely. Once all the souls are absorbed or destroyed, the boss will re-equip his shield, healing himself for each soul absorbed. Chains of Shadow will deal some moderate raid damage to players. The damage does not amplify with each arc so it is still safe stack up. The adds can be stunned, slowed, snared, gripped, and pushed back. Using Gorefiend's Grasp to stack up all the adds is a good idea. However, remember that there is still a limited amount of time so no matter how good your crowd-control is, the adds must still die quickly. If a soul touches the Nullification Barrier, it will despawn, so it can be used to avoid killing every other wave of souls. Shroud of Reversal can be used to copy his Chains of Shadow, which can be used to help DPS the adds. I have seen some glitches with this fight that can make it very difficult on your healers especially for a raid team that may have some members still working on gearing up. Here are some tips that I have found that helped our team. P1 is simple once your tanks get the barrier/interrupt rotation down and providing the boss actually does a fist at least once between Epicenters so the interrupt tank can steal the buff. We did find that moving the boss as little as possible does seem to greatly increase the odds of getting at least one cast of fists between Epicenter casts. Here are a couple tips that seem to help us with P2. Try to position your entire raid on one half of the platform and dump the sparks on the other side. 1. Make sure your raid members know not to touch other flame patches as they move over to dump their sparks. 2. I have seen people moving in a straight line when their spark dumps and it can actually dump in front of them so if they are moving forward they walk right through the flame patch they just dumped. I tell my guys to move until they are about 3 to 4 seconds into the timer then stop let it hit the ground and quickly move out. 3. During draw flame have the entire raid move back away from the boss on the side with no flame patched and wait until he is finished with his channeled cast. The flames that get to the boss early will sit under his feet until he is done with his channel so if your melee are attempting to dps during this part they will cause more stacks. Everyone move away. 4. Call pets back or if you have a pet that is not controllable dismiss them during P2 as the logs show that pets can trigger more patches so this means more stacks. 5. Use the nullification barrier on the 2nd and 4th draw flame so you do not go into P3 with excess stacks. If you see 5 or 6 draw flames you are going to have issues with the timer. 6. The tank with the barrier buff should stand directly on the boss when channeling, if you are a little off to the side he can still get stacks and/or if your melee decide to stay and dps during this part they could get hit by any patches that are not absorbed which again will cause more stacks. P3 is fairly simple as long as your team has decent movement skills. If you have a member or two that is slow on their reaction time this phase can go from simple to very difficult really quickly. He seems to always target a ranged or healer with AR no matter on your position. I recommend tanking the boss at the P3 starting spot. Everyone should have a /range 6 up so when a person gets hit with Arcane Resonance they do not blow up the raid. Space ranged and heals around in a semi-circle. When he starts to cast Arcane Velocity everyone accept those that may still have the AR debuff collapse on the boss. With about 1-2 seconds left on the AV channel everyone should start moving back to their spots so if he casts AR right after the AV channel people are spread out. We use Bloodlust during P2 to make sure we get through that phase as quickly as possible. The tank with the Shroud of Reversal buff should copy Flaming Spear during P2 to maximize dps during that phase. During P3 I have seen them copy both Arcane Shock and Arcane Velocity to maximize dps. If they are going to copy Arcane Velocity make sure they do not cast it on the boss until just before the groups stacks up to maximize the damage he receives as it appears to do more damage to him depending on the amount of people standing next to him. Like I said at the start this fight can be a pain depending on how the boss behaves during the encounter and also if your team has decent reaction skills. I hope this helps as I have seen a lot of teams being stuck on this boss! All these posts are for tanks, what about dps? I went in this morning and died several times. From what I am gathering here, if the tank does his job correctly, dps should just burn him down..right? I'm pretty sure the command is targettarget however it may be targetstarget, im pretty sure someone more accomplished in macros can correct me if im wrong. After testing alot of different macros, I decided to make one of my own.. This will allow you to dps the boss, but when you see the cast you get to steal the ability without loosing your target. This macro works just as good in his AOE phases (he doesnt target any1). You do need to click the extra actionbutton to use the stolen ability. But this steals the ability no matter who is tanking. This also allows you to Oftank the boss whenever you feel the need to dump debuffs from other tank. As of 5.1 thankfully lightning fist is no longer RNG & actually follows a cooldown. Making Phase one MUCH easier for everyone, less mana used, less moving, etc. We were having a real problem with getting the Shroud of Reversal to work with Lightning Fists. The OT (me) would use the Shroud button on the MT, but never get the stolen spell. We realized that the MT wasn't getting stunned by Lightning Fists, and thinking that maybe he was inadvertently dodging the ability, we tried using it on our paladin healer. Same problem, and the healer reported not getting stunned either. On a whim, we tried rotating Feng sideways so he wasn't facing the outer barrier. Success! We're able to steal Lightning Fists almost every time, and almost don't even need Nullification Barrier on phase 1. It seems that there is some kind of bug with Lightning Fists when Feng is facing the outer wall that prevents it from hitting a target. This can be exploited somewhat by the tank with the Shroud of Reversal; when it's their turn to tank the boss (and they already have a stolen Lightning Fists sitting on their extra action bar), they can tank Feng facing the outer wall and not have to worry about avoiding the fists since it won't hit them. A strange thing happened to my hunter on this encounter - in raid finder. My weapon somehow just lost all the durability (to 0/100). None of my other gear was low on durability (at about 80/100). This happened during third phase of the encounter. Yes, I had repaired my gear prior to the raid finder event. Has anyone else experienced anything like this before in this encounter? So, here's a anecdote of a pretty niche but quite amusing little quirk of spell mechanics. Realising that my Disorienting Roar wasn't affecting the Heroic mode adds, I respecced into Ursol's Vortex. For the unaware, Ursol's Vortex is a ground-targetable effect you place which slows mobs that move through it, and the first time they try to leave it, pulls them back to its centre. Naturally, the rest of the entire raid was also doing their utmost to stop the adds from reaching the shield, including our shaman knocking them back once they got too close to it with Thunderstorm. Turns out, these two things interact wonderfully counterproductively - the Vortex taking the punted adds and dragging them all the way back to its centre, death grip style. It was pretty funny when I realised what was happening, but now I know to save Vortex until after the Thunderstorm punt, if needed. 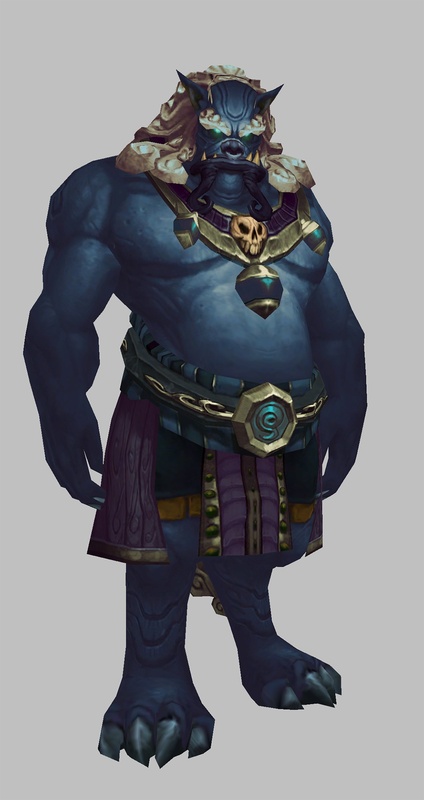 This is probably useless for most of you, but I've been having a hard time finding models for the current bosses and have spent some time chasing them down in WoW Model Viewer 0.7.0.5-mingw3. Enable geoset 0,1,2,3,4,6,7,15 and 18. I'm currently working on getting the rest of the bosses down as well as compiling this info in a short guide and will update this post accordingly. Don't tank him on the edge facing outside of the platform during the first phase, or else the Lightning Fists stun will not be applied to the tank. Me and my main tank discovered this the hard way, we couldn't ever seem to get stuns applied to steal with Shroud of Reversal even though he consistently casts Lightning Fists twice between each Epicenter. Many people think that Lightning Fists is bugged and won't stun the boss. If you believe this you may actually be stealing Lightning Lash as opposed to Lightning Fists. I would recommend downloading recount if you don't have it and checking what Reversals you used. The cooldown on Nullification Barrier won't be up to block two Draw Flames*. You'll have to decide whether to use it on the first and third or second use. If the Barrier is used on the second Draw Flame, healers can CDs to heal through the AoE and DPS can push into phase 3 before another Draw Flame. If the Barrier is used on the first, it will need to be used on a third to prevent stacks carrying into phase 3. Option 1 is better for higher DPS groups, while option 2 is for those with lower DPS (or bad luck). *The cooldown will only be up for every other super AoE attack that the boss uses. **Or you're just really, truly, impeccably unlucky. When Feng says "Oh sage of the ages! Instill to me your arcane wisdom" is he referring to a Titan or something different? When I heard him say it I instantly though Norgannon . Soloed by 688 Combat Rogue. Keep Recuperate on with Glyph of Recovery & Leeching Poison. Use Comabt Readiness for the last 30-20%. Evasion if needed. Its quite tough to solo for a shadow priest. Sometimes he begins to hit really hard. After gearing up a bit in Legion, I wanted to test out 25m Heroic Mogu'shan Vaults. Level 110 Fury Warrior ilvl 828. It wasn't as faceroll as I had hoped lol. You can solo this, it will just take some time. Feng the Accursed is simple. I do not believe you'll run into any mechanics that will give you a hard time. He has about 16mil HP so try not to fall asleep lol. I was under the impression that raids that are two expansions below us would be considered legacy and we get a bonus to damage -- however, this is not the case. In MoP, our damage remains unchanged (compared to Legion). Solo'd this boss along with the entire raid with ease. If you're lower level, just be sure to use defensives and you should be okay. At this level, most of these fights are DPS races because you do take a lot more damage than you would at 110. Generally on these fights I was peaking 350k and ending 150k. Ended at 300k on Stone Guard. WW Monks are OP...But still, 10m heroic is incredibly easy. I ran through stealthed (rogue) and nothing seemed active, no boss. Had to unstealth and touch (run through) all the statues in order to disturb/aggro them. Be careful about burning him down too fast on Normal mode, or else you may get trapped inside the boss area. Also, you may not be able to progress further into the raid even if you leave and return. To activate the fight you must stand on the first two statues in the Golden Hall. Just stand near them and they will wake up. World of Logs: raid data for Feng. Feng the Accursed yells: Great soul of champions past! Bear to me your shield! Feng the Accursed yells: Oh exalted one! Through me you shall melt flesh from bone! Feng the Accursed yells: Oh great spirit! Grant me the power of the earth! Feng the Accursed yells: Oh sage of the ages! Instill to me your arcane wisdom! Feng the Accursed yells: Tender your souls, mortals! These are the halls of the dead! Spirit Bolt – Feng the Accursed unleashes a volley of Spirit Bolts, inflicting 26 Shadow damage to 3 random players. In 25 Player and 25 Player Heroic Difficulty, Feng the Accursed hits 8 random players with Spirit Bolts. Strength of Spirit – Every time Feng absorbs a Mogu Champion Spirit, his damage dealt increases by 5% for the remainder of the encounter. Around 95%, 66%, and 33% remaining life, Feng siphons the essence out of a pre-selected statue of Mogu Champions past, gaining their boon. In Heroic Difficulty, Feng siphons from the statue nearest to him around 100%, 75%, 50%, and 25%. Lightning Lash – Feng's lightning charged fists zap his current target, inflicting normal damage as Nature plus 8 Nature damage every 2 sec for 20 sec. Lightning Fists – Feng slams a lightning-charged fist into the ground, causing a shockwave to pulse in front of him. The shockwave inflicts 68 Nature damage and stuns those caught in its path. Lightning Fists – Feng slams a lightning-charged fist into the ground, inflicting 22 Nature damage and causing three shockwaves to pulse in front of him. The shockwave inflicts 68 Nature damage and stuns those caught in its path. Epicenter – Feng channels a violent earthquake that inflicts Nature damage. The quake inflicts more damage towards its epicenter, and reduces players' chance to hit by 75%. Flaming Spear – Feng's fiery spear sears the flesh of his current target, inflicting 25% of his normal melee attack as Fire damage. The fire then inflicts an additional 8 Fire damage every 2 sec. for 20 sec. Wildfire Spark – Feng the Accursed targets a random player then engulfs them with a Wildfire Spark. The Spark explodes after 5 seconds, igniting a Wildfire at their location. The Wildfire then spreads out and inflicts 116975 Fire damage every 1 sec. to any player standing within the fire. Draw Flame – Feng attempts to absorb the Wildfire and cause his melee swings to inflict 14 additional Fire damage to all enemies. Arcane Shock – Feng's arcane-infused staff shocks his current target, inflicting normal damage as Arcane plus 8 Arcane damage every 2 sec for 20 sec. Arcane Velocity – Feng channels an Arcane storm, inflicting 11 Arcane damage every 1 sec. to all enemies. The bolts from the storm inflict increasing damage to targets as they stand further away from Feng. Arcane Resonance – Feng charges random players with Arcane Resonance, inflicting 8 Arcane damage to the target's nearby allies within 6 yards. Each additional affected player amplifies the damage done to them all by 8. Shadowburn – Feng burns his current target's soul, inflicting normal damage as Shadow plus 8 Shadow damage every 2 sec for 20 sec. Siphoning Shield – Feng's cursed shield draws the souls of 10 random enemies to it, healing him for 5% of his life per absorbed soul. Siphoning Shield – Feng's cursed shield draws the souls of 5 random enemies to it, healing him for 10% of his life per absorbed soul. Chains of Shadow – Feng strikes a random player with a Chain of Shadow that arcs to another nearby player. The Chain affects up to 3 targets, inflicting diminishing Shadow damage to each successive target. Players assuming the tank role gain access to the leftover essence shards from the awakened statues. Nullification Barrier – Players with this Stolen Essence of Stone may channel a Nullification Barrier around themselves for 6 sec. The Barrier negates any harmful magical effects cast on players standing inside the Barrier. The barrier will also nullify harmful effects in the world such as Wildfire and Lightning Charge. The barrier will also nullify harmful effects in the world such as Wildfire, Shadow Shields or Images, and Lightning Charge. Shroud of Reversal – A player with this Stolen Essence of Stone may extend a Shroud of Reversal around an ally, allowing the player to mimic the effects of the next harmful ability that strikes the ally.